There is also a brick BBQ and picnic benches available for you to utilise, under cover so you can sit out whatever the weather. All we ask is that you try and leave it as clean as you would like to find it. There is a minimum 2 night booking and 3 nights if it booking falls over bank holiday weekends. We have built a new field shelter to house our washing up area, in there you’ll find 2 x Fridges and freezers available – possibly more for 2015, 1 x kettle free to use any time of the day, toaster. Washing machine and tumble dryer (for a small charge), toy box (including board games and kids toys), book shelf for book swap. Pub quiz questions and answers (printed out for you) so you can hold you’re own quiz night around your campfire, if there’s not enough of you, you can always challenge your neighbours! A rural tent-only Somerset campsite, in a top location for visits to Bath, Salisbury and Frome. We are pleased and proud to say we are located in the village of Woolverton, between Beckington and Norton St Phillip, just on the outskirts of Frome and Bath. Easy access off the A36, but still based in true Somerset countryside. We feel this is the perfect location for our guests to be based to enjoy these beautiful surroundings, with so much to see and do locally. 6 showers, 5 mens toilets, 7 women's toilets and a family unit. The washing up area has sinks, 2 fridge freezers, a kettle, microwave, book swap, kids toys, washing machine and tumble dryer. There's a trampoline, wooden pirate ship, swings, grass mound for kids to play on and ride-on tractors and scooters. There are plenty of animals to be found. Small ponies in the top field, horses the other side of the fence and free range chickens and ducks roaming around. An onsite shop sells all the camping essentials, including local beers and wine. 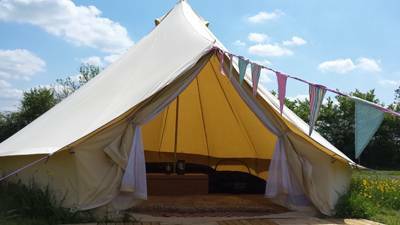 2 bell tents for hire, 12 electrical hook up pitches and 30 standard pitches. Tents only. Dogs, families and groups on prior arrangement – yes. Motorhomes, trailer-tents and caravans – no. Pitchperfect Camping lies in an excellent location, with the local villages of Rode and Woolverton boasting five pubs between them. It's also a short drive into Frome (01373 465757), one of Somerset's most attractive towns. The 14th century built Nunney Castle (08703 331181) vies for your attention along with Longleat (01985 844400), an Elizabethan stately home with a safari park in its extensive grounds (the campsite can offer discounts). Wardour Castle (01747 870487) and Stonehenge (08703 331181) border historical Salisbury, while in the opposite direction the elegant city of Bath is based around England's only natural hot springs. Bristol, beyond, also makes for a good day trip, while lovers of the outdoors should instead head for The New Forest (01590 646600), North Wessex Downs (01488 685440) or the Mendip Hills (01761 462338), all within a hour's drive. The Red Lion (01373 830350) serves excellent pub grub within short walking distance. The Mill (01373 831100) in Rode is another mile down the road and is great for families. There's two award-winning farm shops just a 5 minute drive away, both of which have beer gardens and kid's play areas. There's also a good Indian restaurant at the end of the lane called The Bay Leaf (01373 474825). Easter – end of September. Standard Pitch (includes 2 adults & 1 car) £19.00. Electrical pitch £23.00. Check website for full details. From Bath – heading south: from the A36 heading towards Warminster you'll pass the villages of Hinton Charterhouse, and later Norton St Phillip. Enter in to the village of Woolverton and pass the Red Lion pub on your left hand side. There are 3 right hand turns, you will need to take the 2nd, towards Lullington, be careful as it is on a bend, and so indicate early. This road will take you straight to the campsite, you will drive straight over a mini crossroads and pass Sleight Farm on your right hand side, and the site is 300 yards from Sleight Farm on the Right. From Frome – heading north: on the A361 heading towards Bath, you will enter on to the A36 there are a series of roundabouts all of which you head towards Bath. The final roundabout, at Beckington (which has a Texaco petrol station & Little Chef) keep in left hand lane to go straight on to Bath, approximately ½ mile down the road you will pass over the River Frome and on the left hand side after the Toll House turn left towards Laverton. You'll approach a mini cross road, at which point you turn left, passing Sleight Farm on your right hand side. The site is 300 yards from Sleight Farm on the right. The nearest train stations are Frome, Warminster or Westbury. All will be a taxi ride from there though. There is a bus stop outside the Red Lion in Woolverton which is about a 10 min walk away but they have regular services.